In the last post I said there would be more posts about a recent trip to Ecuador and they are coming, but first, a slight detour. Hope you don’t mind. 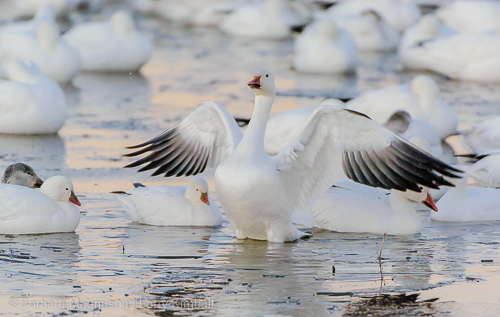 Getting ready for the day a snow goose stretches. Do you like places that take your senses by storm? 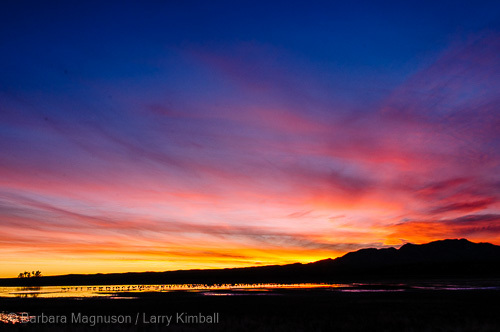 If you have the opportunity to visit Bosque del Apache National Wildlife Refuge in New Mexico, do it. This is the northern Chihuahuan Desert so the narrow band of green that follows the path of the Rio Grande River is a magnet to a wide variety of birds. The Bosque concentrates that variety into an almost mind-bending display. The numbers tell the story, 25,000 ducks, 40,000 light geese (Ross and Snow) and some years up to 14,000 Sandhill Cranes. The count does fluctuate day-to-day, week to week. This aggregation is a winter event, November through January. That is not to say the warmer months are not worthy of a visit, it’s just different. Hot temps bring out the lizards and snakes along with neotropical birds, all great subjects. We made two trips down there recently, one in November 2014 and then this January. It’s a 7 hour drive for us so while we need to do a little planning, the trip can be on the spur of the moment side of things (just gotta get someone to watch our cats and fill the outside bird feeders). 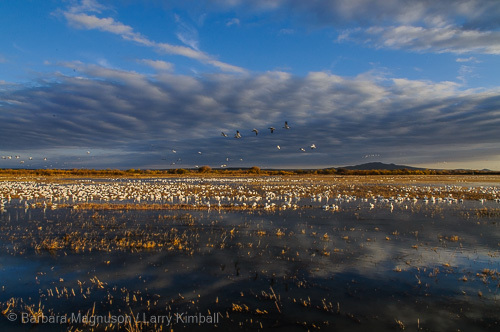 November brings the colors of fall with the huge numbers of birds and reasonable temperatures (cold mornings with warm days, generally), cottonwood yellows and blue skies. January should be cold, don’t you think? This year it wasn’t, at least during the few days we were there (62 the day we arrived, sheesh). Not any ice on the ponds, which was a shock to us. Even some of the willows were beginning to color up with shades of early spring. No need for the hand warmers and layers that are the norm. What will you see? Mass ascensions of snow-white geese, wing tips black as if dipped in ink. 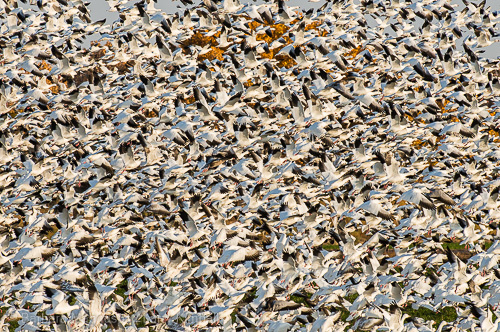 Hundreds to literally thousands of birds lift into the air together in a cacophony of sound and sight, unforgettable to the senses. 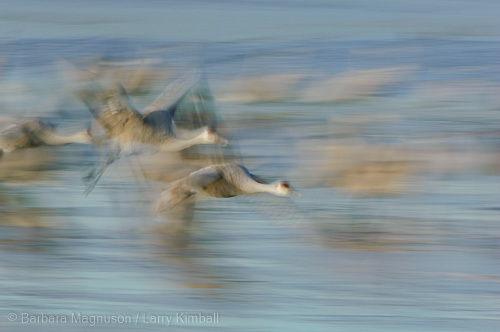 Sandhill Cranes winging across the sky in that elegance that only cranes bring to flight. 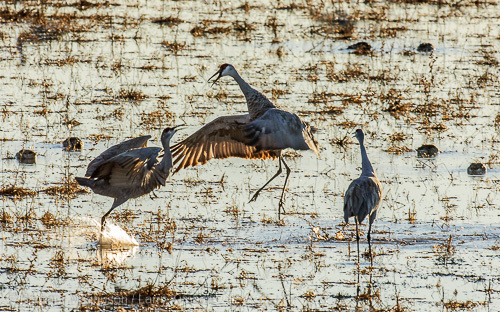 The calls of the Sandhill Crane are as wild and electrifying to my ear as the howling of coyotes, wolves or the bugling of elk, hearing them I always find myself smiling. Voices of the wild, silenced over too much of our land. 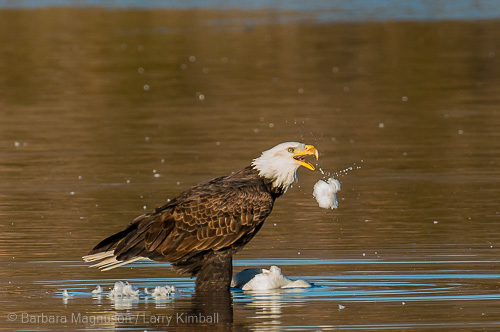 Red-tailed, Swainson’s, Northern Harrier hawks and American Kestrels cruise the skies or sit quietly in trees waiting for the chance at a mouse or vole rustling in the grasses. 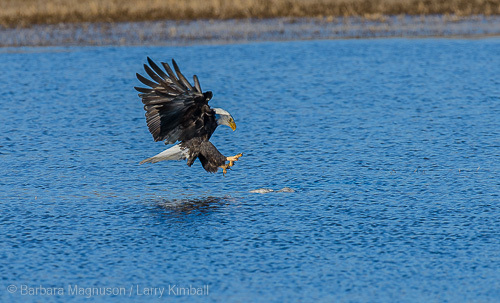 And the eagles, Golden and Bald, drift across the ponds and flooded fields always aware of the injured or ill birds that such largess serves up. 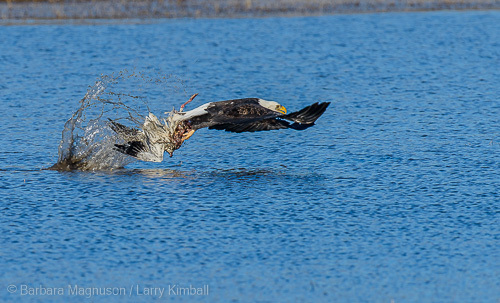 The plucking begins after failed attempt to carry goose to shore. 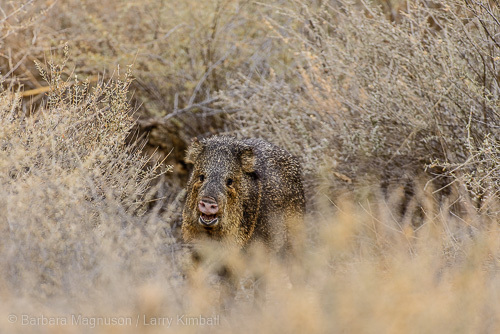 If luck is on your side a lion, bobcat or herd of javelina may appear, other desert natives like roadrunners and quail abound. Mountain Lion loafing on refuge service road. 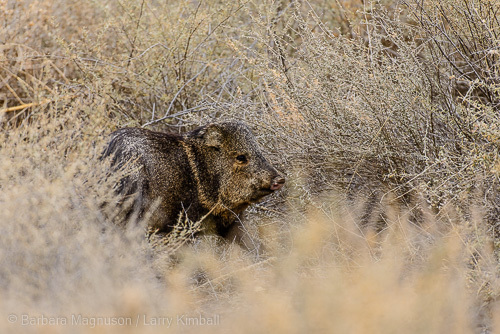 And since to experience much of the wildlife here you will be out early and late, you will experience sunrise and sunset with colors that beggar description. 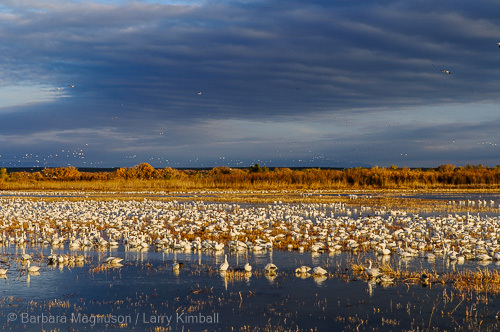 There is the occasional sunrise or sunset in this place that will even eclipse the staggering numbers of birds. 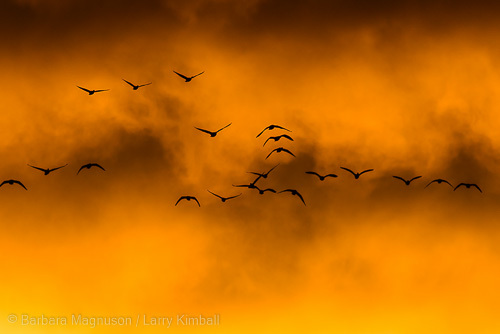 Snow geese fill the sky at sunrise. 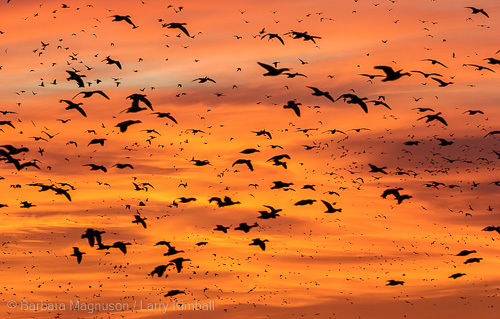 Filling the sky with birds at sunrise. 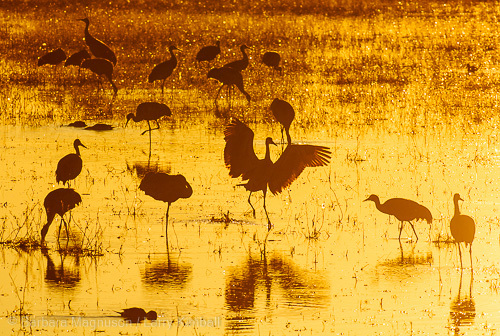 Afternoon in Bosque del Apache. 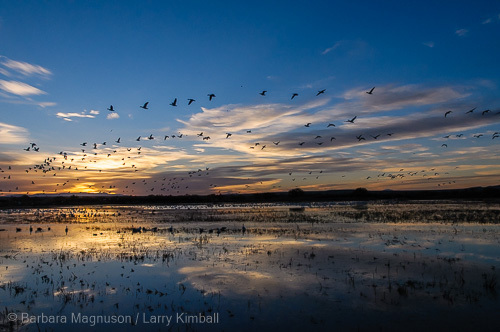 Awesome is one of the most overused and abused words in use today (a hamburger or soft drink is not awesome, nor is a new phone), but a winter visit to the Bosque will bring that word with its genuine meaning to your lips often. 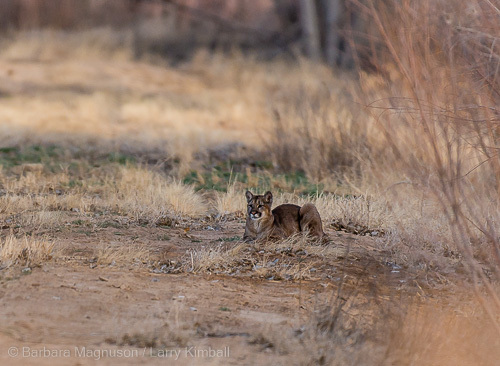 This entry was posted on January 25, 2015 by pronghornwildlife2. 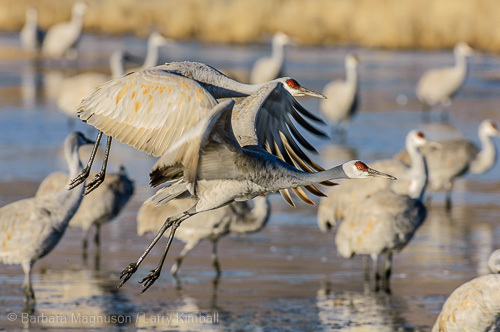 It was filed under Nature, Travel and was tagged with birds, Bosque del Apache National Wildlife Refuge, environment, Javelina, Mountain Lion, natural history, nature, Sandhill Cranes, Snow Geese, travel, wildlife.